The following miniatures are a small group of frogs and toads I have assembled for gaming purposes. The first two pictures are of frog folk from East Riding Miniatures. The first three figures below, are from the Frogfolk Command (FT65), followed by the two poses from Frogfolk with Swords (FT69), one pose from Frogfolk with Spears (FT68), and two poses from Frogfolk Ambushers (FT70). The next picture shows one pose from Frogfolk with Blowpipes (FT67), and the two poses of Frogfolk Archers (FT66). I really like this range of frogs from ERM. 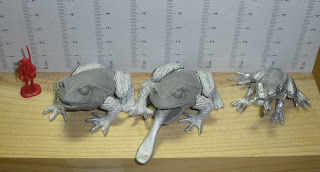 They are currently the only 15mm fantasy frog people in production. 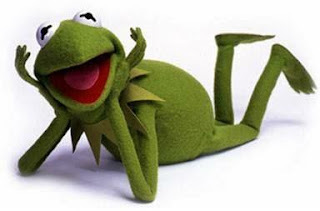 However, Eureka is halfway to producing some of their 28mm Warrior Frog line in 15mm through the 300 Club, and I understand that SLM will also be releasing frog people next year. For normal frogs which can double as familiars, Chariot has a Plague of Frogs (CFB02) in 15mm consisting of ~20 frogs on circular bases. Irregular produces Kermit the Barbarian (CR27) on a square base, as part of their 6mm fantasy line. The third miniature below is a Ral Partha toad from their Familiars set (02-958), followed by Reaper's toad familiar from their Familiar Pack III (02593). These toads are rather large, and the Reaper toad in particular would be good cane toad in 1/72. Next are the giant frogs: The first is the Giant Frog from Citadel (FF56), followed by three different poses from Black Tree Design's Frog Swarm (FA0822). Even larger giant frogs and toads follow. The first two miniatures below are toad mounts from Eureka's Warrior Frog Cavalry (100FRG26). There are six different variants made up by combining three different types of body with two different sets of legs. The bodies are made of a gray resin, while the legs are made of metal. One of the frogs also comes with an extended tongue made of metal. The final Giant Frog (M134) is from BTD. It is a two part figure, with separately molded front legs. The feet of an unfortunate victim protrude from it's mouth, but I think I will be removing them. What a collector! I just wanted to say I appreciate the resource you provide. It's good to see all the manufacturers that produce on a certain theme, and it's even better to see them next to each other for comparison. I'm glad you find the blog useful. My collection of miniatures tends to be a bit eclectic since I try to find figures ranging from 6mm to 28mm+ that are compatible with 1/72 fantasy gaming. Also, congratulations on Ferrous Lands being selected as a Blog of Note.